The 84-year-old, who was the last of the Famous Five, died in July last year. 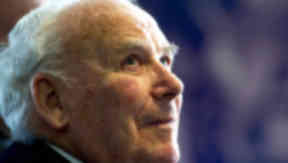 A new street in Edinburgh is to be named after Hibs legend Lawrie Reilly. The 84-year-old died in July last year after losing a battle with bone cancer. He was the last of the Famous Five, the group of players which helped Hibs win three league championships in 1948, 1951 and 1952. The new development off Albion Road in the Leith area of Edinburgh sits behind Hibs stadium Easter Road. Officials selected the name Thyne Place for the street, which will have 206 new homes on it, and asked the three local councillors for their thoughts on it. The name would have been in honour of print-maker William Thyne, who started his company in Lochend in 1871. Cllr Alex Lunn suggested they name the street after Lawrie instead and his fellow councillors agreed. However, current laws mean a street cannot be named after someone until they have been dead for ten years, meaning Lawrie could not be honoured until 2023. The decision went before the City of Edinburgh Council’s planning committee on Thursday, with councillors recommended to name the street Thyne Place. However, members decided to vote for Lawrie Reilly Place.